Unknown driver rushes to get somewhere. 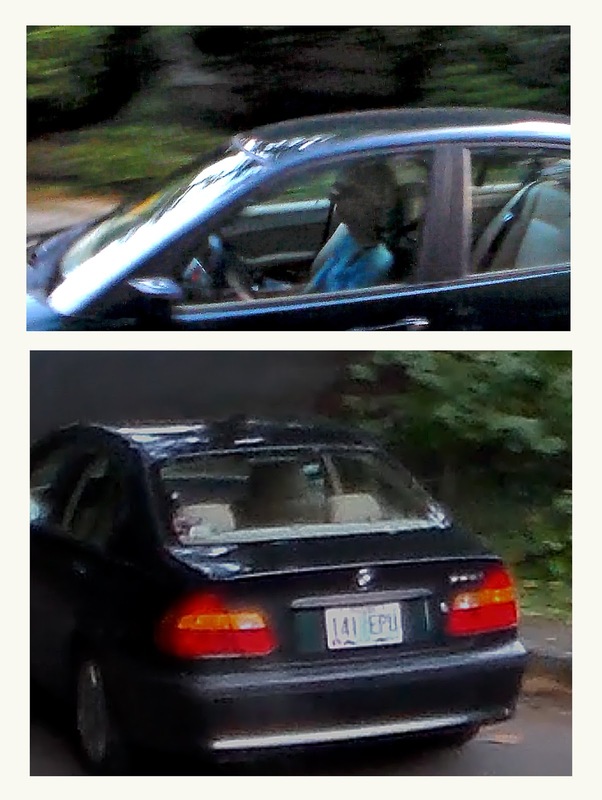 LSS has had a few near misses with the above lady driving the dark BMW. Each time LSS has honked and tried to indicate that BMW Lady's speed was excessive. The lady has so far failed to acknowledge LSS honking or adjust her speed. Today I went outside with a camera and filmed her driving past (she did not turn her head as I panned the camera). She seems to have a schedule in mind, so when she is running late her speeds increase. I suspect BMW Lady is a normal, nice person who would be bewildered by the commotion she is causing. We have another neighbor who drives a light BMW. He immediately stopped when the eight-year-old on his bike veered quickly into the street the other day. I shudder to think what the outcome would be if BMW Lady were put to the same test. I would like to ask her if she has grandchildren. I would ask if she would drive differently if she knew her grandchildren were in the street. I would tell her that someone else's grandchildren, children, wife are in the street and she should slow down. I believe we will find this person's name and address as she apparently lives close by. LSS would like to start off by politely confronting this person.